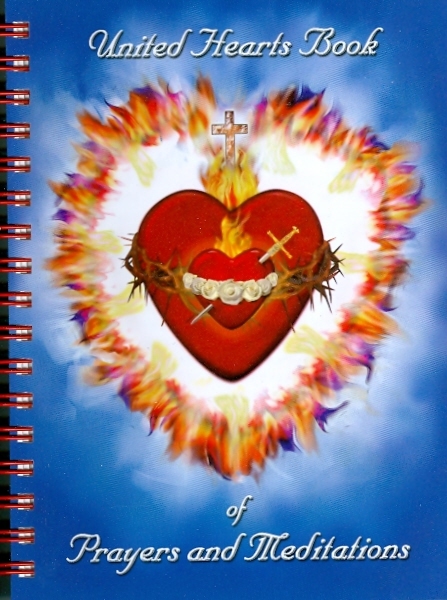 Book: "United Hearts Book of Prayers and Meditations". Book: United Hearts Book of Prayers and Meditations. Morning Prayers, Prayers to Overcome Faults, Prayer Petitions for Personal Holiness, Mass and Eucharistic Adoration, Rosary Prayers and Meditations, Meditating on the Passion. Acts of Consecration, Blessings, Invocations and Ejaculatory Prayers, Novenas, Divine Victimhood Prayers, Offering of Past Crosses. Prayers for the World, Worldwide Consecration to the United Hearts, The Rosary of the Unborn, Prayers for Children, Family Consecration to the United Hearts, Prayers for the Poor Souls in Purgatory. St. Michael's Shield of Truth Devotion, Protection of the Faith Prayers, Prayers for the Mission, Prayer Chambers, Confraternity Prayers, Pilgrim Prayers. Front cover measures 4.5 in. x 6 in.